Seward Consulting Ltd. has developed a number of products for various industries over the years. Here is a list of some of these products. ProtoMart incorporates many features of its predecessor, Previewer 2.0. With Previewer, users could quickly define what a cube should look like in terms of Dimensions, Measures, and Allocation percentages at each level in the Dimension hierarchy. Generated data points could then be converted to cubes. ProtoMart is a Windows based application that gives you the power to easily design and construct data marts. ProtoMart reduces the development time for data mart creation! Previewer is a data modeling tool for demonstrating the power of the Cognos Business Intelligence tool 'PowerPlay'. 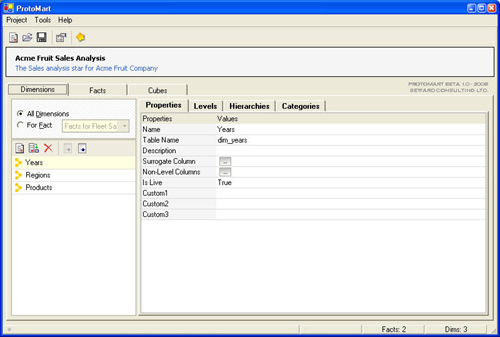 Cognos PowerPlay draws information from relational databases to model and build PowerCubes ("Cubes"). Cubes are data sets with over 50 million consolidated rows of data and up to 500,000 categories (members). Business rules and calculations (for example, percentage growth and market share change) can be built right into them. Cubes and reports can be deployed to Web clients, or to Windows and Excel clients, all using the same application server. Previewer will generate sample data with realistic fluctuations, based on an organization's specific metrics. This allows prospective PowerPlay users to see how their corporation's data might look with PowerPlay, and how PowerPlay can add value to their business. Previewer is a product intended to shorten the sales cycle for COGNOS sales reps and COGNOS Value Added Resellers, as well as reducing the expenses associating with manually creating sample PowerPlay Cubes. Job Assistance is a powerful report and batch job management system that will help users manage their own reporting tasks, set up report and batch job scheduling, and reduce needless and redundant output generated on system printers. With Job Assistance, it is possible to setup a controlled report and batch processing management environment and will reduce the costs of installation and de-installation of production and ad-hoc reporting and job processing. Job Assistance currently runs on HP/9000 Unix servers and was developed in PowerHouse with CISAM file structures. It can be easily integrated into current application systems with minimal effort. Quote Magician is the fastest, easiest way to quickly create and manage quote production within your organization. Producing quotes is one of the most time consuming tasks your salespeople will encounter. A great deal of time can be invested ensuring a quote lists all the required items for a clients needs, checking and double-checking prices and let's not forget ensuring that you are making a profit. Quote Magician enables companies that re-sell products to eliminate the intensive nature of producing quotes. Quote Magician is an electronic price list manager that allows you you to build quotes with product-by-product margins, required component linking, US currency conversion, percentage or amount discounting, optional PST/GST/Shipping charges, manufacturer support, gross/net/cost of goods display and much, much more. In addition to quote production capabilities, Quote Magician allows rapid production of Purchase/Work Orders, tracks sales commisions for your sales team, and can integrate with Goldmine for customer specific quoting. This fully-featured quote production tool is a must-have if your sales force spend any time manually producing quotes.